After you log on to Ozark Bank's Online Banking site, you will automatically see a summary of your linked, Internet-enabled accounts. This summary will show the type of account and current balance. To view more information on any listed account, click on the account name. You can view your current balance and recent account activity by clicking on your account number. Subsequent menu selections will allow you to view all transactions from the previous business day, current statement or even a previous statement. You can also search for specific transactions and view check images. Transferring funds between your accounts at Ozark Bank is fast, secure, and convenient. You can setup a one-time transfer or schedule recurring transfers on a regular frequency. Save postage by scheduling loan payments online. 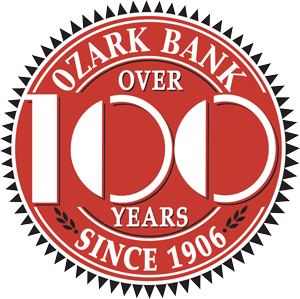 Payments on your Ozark Bank loan can be set up for a one-time payment or on a recurring basis from any of your Ozark Bank deposit accounts. The loan and deposit accounts must be linked to your Online Banking account. Stopping payment on a check you've written is fast and convenient through an online form. Standard Stop Payment rates apply. Account activity can be downloaded in various formats to allow for easy import into Microsoft Money or other applications such as spreadsheets or word processors. Available file types include .OFX, .CSV, and .TXT. See all your Online Banking features on one convenient, easy to manage Dashboard. Save paper and sign up for Ozark Bank E-Statements for your checking and savings accounts. An email will be sent when your statement is available, and the email will contain a secure link to log in and access your statements. Sign on to Online Banking to enroll today. Click here for E-Statement Enrollment Instructions. 21st Century banking meeting your schedule and needs!